Grasses remain the most valuable plant on earth. Sadly, they are taken for granted. They have a marvelous range of adaptation, many species with outstanding attributes, and provide food to humans and feed to animals like no other plant. "Putting down its roots four, even six feet into the soil improving its structure, ventilating it letting water punctrate it keeping moisture loss low--held its power and kept the environment from destroying itself." Grasses must be looked at individually to be well understood. Grasses are mostly herbaceous (not woody), monocotyledon plants with jointed stems and sheathed leaves. But they may be warm or cool season plants depending on how they photosynthesize. They may be annual or perennial. They are distinct in morphology and physiology but so common few take the time to differentiate them. Perhaps most importantly, grasses have a wonderful ability to yield more, and grow again when they are cut or grazed. This is the key to the importance grasses have on our earth. 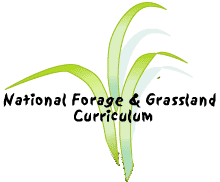 Understanding how each grass species grows and regrows after being mowed or grazed is very important to making the most of the grasses available.